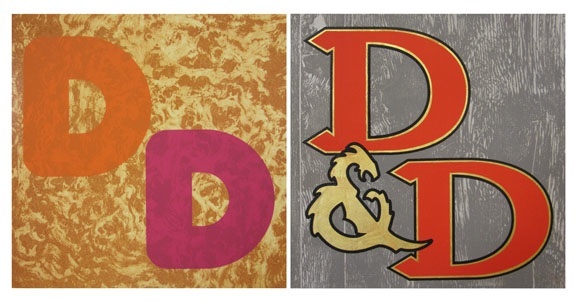 Double Dilly is a 3 color, 4 block, intaglio wiped and relief rolled woodcut. The process involves wiping ink into the grain of the wood and delicately removing the excess from the surface. Once wiped, the block is rolled with ink and passed through the press. Baldridge employs BC grade plywood patches, reminiscent of the Dairy Queen logo, to form the structure of the images. 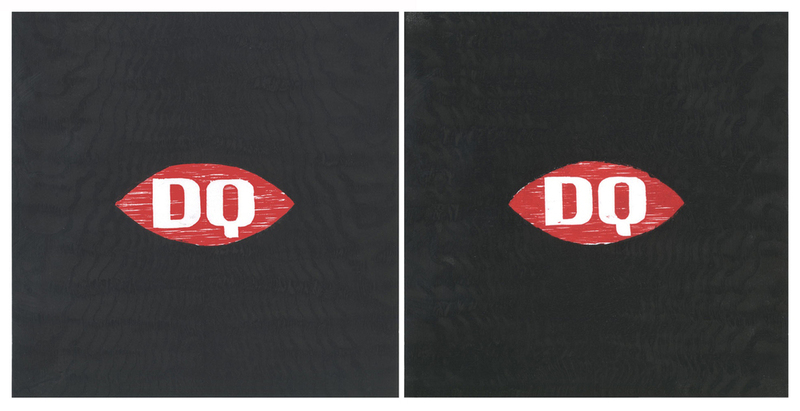 The black on black graining was created by applying a mirror cut Japanese Ash veneer to plywood, then removing wood for the red DQ logo. Double Dilly, a reference to the 1955 classic Dilly Bar, speaks of nostalgia for the simpler times of feel good ice cream and Warren Buffet’s economic ideology as the owner of the Dairy Queen franchise. Baldridge’s graceful design aesthetic evokes the romance of 2nd tier fast-food restaurants, stoner economics, and a longing for an escape from mid-recession America. Here Come the Miracles is a 7 color, 64 block, intaglio wiped and relief rolled wood cut printed in two parts on thin mulberry paper. The process involves wiping ink into the grain of the wood and delicately removing the excess from the surface. Once wiped, the block is rolled with ink in a different color. This process is repeated on 56 separate blocks. After inking, the blocks are assembled in a wood form and the paper is carefully laid over the blocks and passed through an etching press. The hand-cut wood block text for the abstracted knuckles is then inked and printed in a separate layer. Here Come the Miracles is based in part on the visual language of Russian jail tattoos. These tattoos involve a whole series of subversive images and codes, often indiscernible to those outside the criminal underworld. Baldridge’s use of “Okay, Fine” on abstracted knuckles, where words like love, hate, and evil would typically reside, comments on the meaningless trend of tattoos in today’s pop culture, contrasting with the very real political significance of tattoos in Russian jail culture. The colors were drawn from traditional Russian textiles and organized in a series of bars referencing the text’s prison origins. Baldridge has created a sense of serenity with his work, the full impact of which comes only with time. Glen Baldridge is a New York City based artist and the Founder/ President of Forth Estate, a fine art print publishing company in New York City. Baldridge’s work utilizes humor and beauty to investigate popular culture trends. Baldridge’s work has a sense of space that is both inviting and daunting, undoubtedly influenced by his upbringing in Montana.